There's been a request that I explain the mantra-mudra puja that I do for my salagrama silas. This constitutes the usual form of my daily worship. 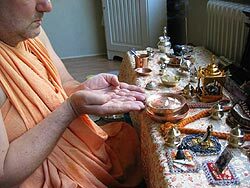 I offer upacaras like snana (bathing) and dhupa-dipa-puspa (incense, lamp and flower) in the form of mantra and mudra. 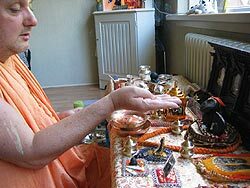 But on days when I resume worship after an interruption (for example, after a long journey), and on special holy days like Ekadasi and Janmastami, I offer dravya (physical items). That takes more time to prepare and execute. 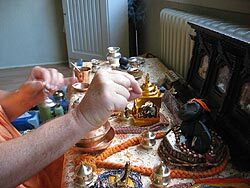 Srila Prabhupada said that daily cooking and Deity worship should be completed within an hour's time. 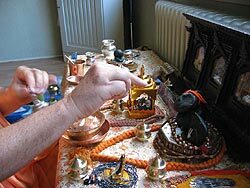 So generally I try to keep to that instruction by offering mantra-mudra puja. 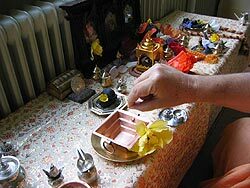 There are 16 upacaras (items of offering), thus there are 16 offering mantras. Below is a list of 20 mantras. This list contains more than 16 only because there are some repetitions. 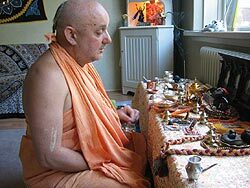 What this list shows is the order in which the upacaras are offered during the puja; accordingly, acamana (purification of the mouth) is offered at 3 different times (after the first time the acamana mantra changes to idam punaracamaniyam, "I again offer acamana.") 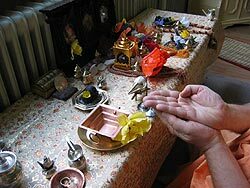 Also, at the end an offering of sarvam (all upacaras) is made to conclude the puja to each worshipable personality. 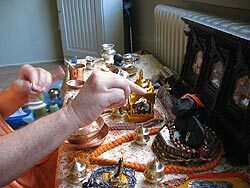 In this way, though there are only 16 upacaras, in the course of my puja I am chanting 20 offering mantras. 1. idam asanam--offering a seat (all these upacara mantras are to be spoken together with the mantra that addresses the Deity, such as klim gopijanaballabhaya namah). Full acamana (om kesavaya manah etc. 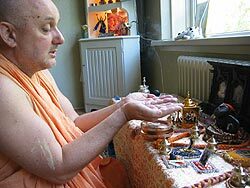 ), visnu smaranam, mangala santi, bhuta-suddhi, obeisances, om apavitra acamana with pranayama mudra. 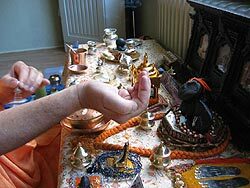 With mantras and sprinkling of water I draw a protective circle around the place of puja, show khadga-mudra for dig-bandha (closing the directions), and purify everything within the circle with Nrsimha-mantra. Worship of Ananta-Nrsimha Deity and Nrsimha-sila (bathing, cloth, ornaments, gandha, throne, offering everything, chant Nrsimha-gayatri, arati of dhupa-dipa-puspa while chanting Nrsimha prayers. This is done with mantra-mudra. Worship of Srila Prabhupada with all upacaras except tulasi and mala which will be presented later to HDG as prasadam. The whole worship is done with mantra-mudra. 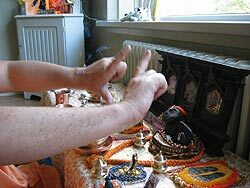 Worship of Gauranga, 16 upacaras with mantra-mudra. Worship of Sri-Sri Jagannatha-Sudarsana silas. This is the main worship. 16 upacaras are offered. 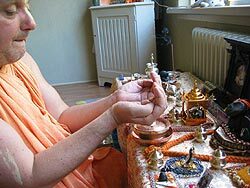 Most are mantra-mudra offerings except for naivedya. 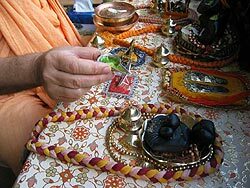 Tulsi and puspa offered to feet of SSJS silas during the offering of these upacaras; more tulsis and flowers are offered to all silas at the conclusion of the worship. a seat to the Lord. Padya mudra. 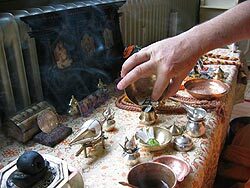 I prepare the snana-vedi with a tulasi leaf and flower petals and then show cakra and dhenu mudras. Over the vedi I chant klim gopijanaballabhaya namah eight time, counting the mantra on my fingers. Then I show matsya mudra. 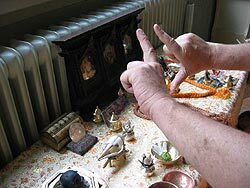 With avahana mudra I invite the silas to sit on the snana-vedi. I do not physically place Them on the vedi; I meditate on Their going there. Showing snana mudras. 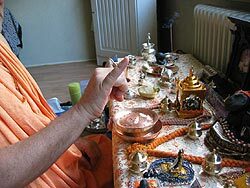 The SSJS silas are bathed eight times by mudra-mantra. 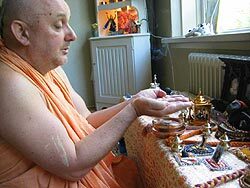 I chant a verse from the Sri Jagannatha-astakam for each bath. after bathing as I prepared the snana-vedi. Having returned to Their throne, Their are dressed. Vastra mudra is shown. Puspa mudra. Tulasi patra mudra (identical to puspa mudra). "Raam-Raam-Raam"... ...and then show Tham-bija mudra and chant "Tham-Tham-Tham." This procedure burns off impurities and nectarizes the offering. Cakra and dhenu mudras, 8 times chanting Deity's mula-mantra, then matsya-mudra. 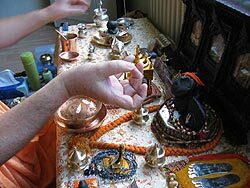 Then I ring the bell, chant the offering prayers, first line of gayatri, and chant Purusa-sukta. This is a general mudra. One could use it for any item. I show it when it is time to offer water after naivedya. Punaracamaniya mudra. The general mudra again, now shown for tambula. Malya mudra. Showing the sarva mudra, which is a gesture made with the right hand on both sides of the Deity, starting on the left. I worship the lotus feet of Srimati Radharani, which stand next to SSJS, with mantra-mudra of dhupa, dipa, puspa and mala. 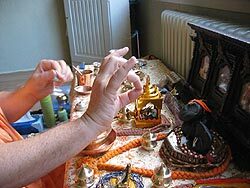 Then I chant Her gayatri and offer prayers to SSJS and Srimati Radharana together. 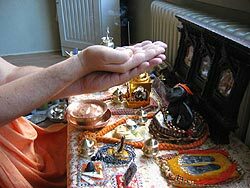 I worship Sri-Sri Laksmi-Sesasayi by offering the same mantra-mudras as to SSJS. However I do not offer physical naivedya. Since SSJS are the main Deities, all other silas share the physical naivedya that They receive. I worship Sri Giriraja by offering mantra-mudras for bathing, dressing, ornaments, gandha, garlands, flute and everything. 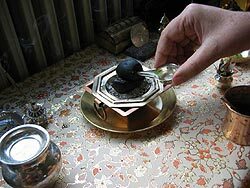 These pictures show the offering of tulasi that is made at the end, to all silas. I chant Tulasi prayers at this time. Her leaves are applied to each of the silas. 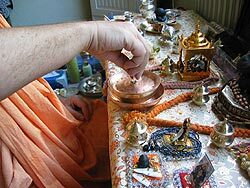 Here, prasadam from the snana-vedi and the tulasi offering is placed in a brass pot that is then offered to Srila Prabhupada and Sri Guruparampara. 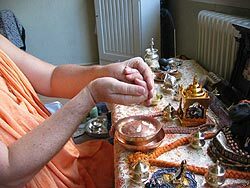 Garlands are offered by mantra-mudra to all acaryas. After the puja I offer a fire yajna. But this, too, on most days I do by mantra-mudra. 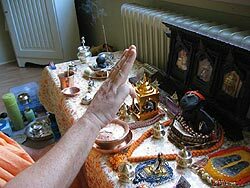 Instead of physically offering ghee into a fire, I offer the Ram-bija mudra and the dipa mudra to the yajna-vedi. The Yajna-purusa silas preside over the fire sacrifice. Actually, this yajna constitutes the specific worship for these two silas.